25 Ideas to Re-Invent Your Living Space – For Free! Here at Blockposters, we love the idea of frugal home decoration. That’s why we offer a free poster printing service for any picture you choose! But we also love celebrating other money-saving design ideas, and this blog post runs through some of our favourites. From repurposing outdated technology to creating unique artwork from everyday objects, there’s something for everyone. 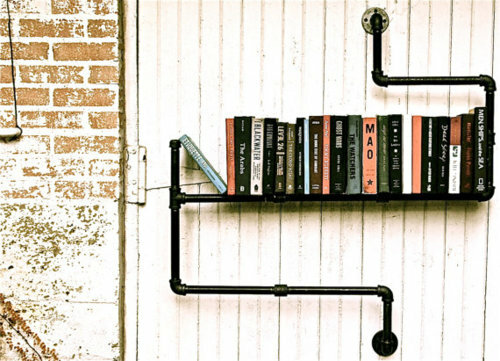 You don’t have to be a plumber for this industrial chic installation to become a talking point in your home. This technique looks especially great against exposed brickwork. A cushion recovered with a retro t-shirt. You’ll need: T-shirt and a cushion. A sewing machine would help. This idea is perfect for anyone with a closet full of old shirts that they never wear but can’t deal with ditching. It breathes new life into old clothes, whilst creating a cool, comfy cushion at the same time. A practical, colourful and quirky dock that charges your gadgets. Load of homes, both child-filled and child-free, have Lego kicking around. An added bonus is that a Lego figure’s hand is the perfect size for securely holding most phone charger cables. This quick and easy contraption is idea for anyone who wants to watch a big screen without forking out. The picture isn’t perfect, but the household objects needed cost far less than a cinema ticket. You’ll need: An old tablet or smartphone and a box photo frame. If you love looking at pictures but can’t decide which ones to frame, this is a perfect alternative that puts an older device to good use. It’s a commonly known fact that guitars are the coolest thing ever. This system is easy to put together and will become an immediate talking point in the home of anyone who loves music. This is perfect for people who love retro tech nearly as much as they do their pets. Colourful iMacs from the 90s work particularly well for this project. 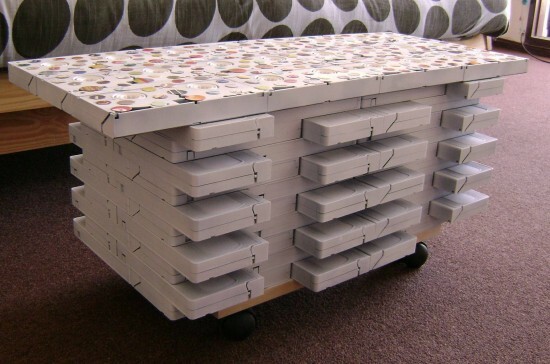 A coffee table made from VHS tapes… obviously. For anyone who misses the joys of rewinding and tracking adjustment. It’s perfect for kicking your feet up on whilst reminiscing about the good old days and watching Netflix. Vintage records bent into unique bookends. You’ll need: Two vinyl records and some hot water. 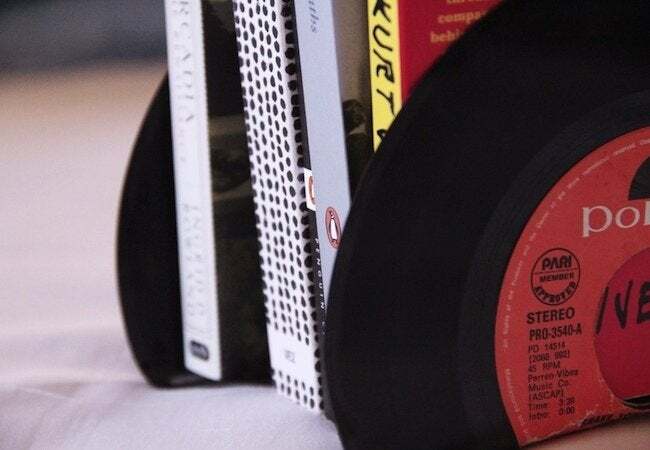 Music and book-lovers alike will dig these bookends. If you don’t have any vinyl lying around or don’t want to bend your collection, records are often given online or at boot-sales. Use a smartphone projector to create some unique artwork. You’ll need: Paint, brushes, a pencil and a DIY projector. You don’t have to have major skills to create an impressive work of art on your wall. Provided you can trace lines and colour in, a one-off piece of artwork can be created in a surprisingly short time. 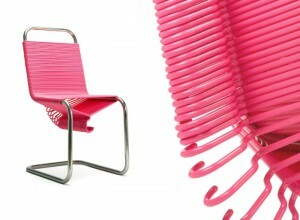 A chair made from spare or free hangers and an old frame. You’ll need: Metal chair frame, coat-hangers, glue and paint (optional). This chair would work perfectly in the home of anyone with a passion for fashion, either in the living room or paired alongside an existing dressing table. You’ll need: Coat-hangers, magazines and nails. This idea works in any home and is particularly effective with fashion, film and music magazines. It can be adapted to work in any room in the home. A stool made from old magazines. You’ll need: Pile of magazines, cushion, two belts/straps and scrap wood (optional). 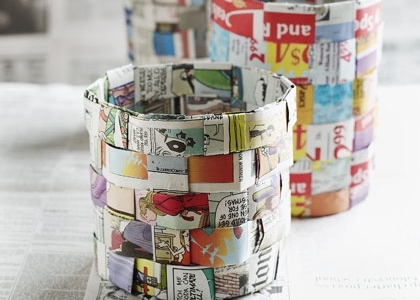 This is perfect for anyone who hoards magazines, reads them once and yet can’t bear to part with them. It turns a space-stealer into a fun feature that works in any home. You’ll need: T-shirt, canvas/wood/cardboard and a staple gun. 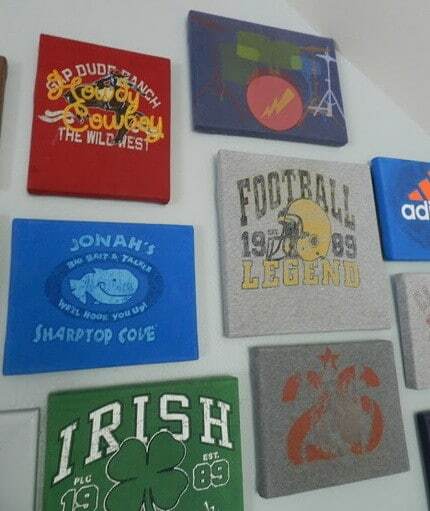 Like the t-shirt cushions, this is ideal for anyone who attaches memories to their clothing. It works well for any garment with a bold design and especially well with band and sport shirts. You’ll need: lots of colour swatches and some Blu-Tack/tape. 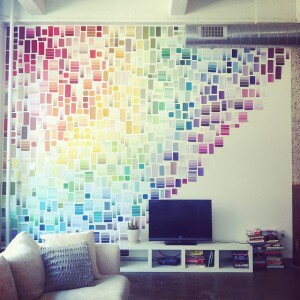 This is a great idea for anyone who likes a bit of colour in their lives. The possibilities are endless with free colour swatches and the most artistic may even be able to create pictures with them. You’ll need: Newspapers, sticky tape and a stapler. This eco-friendly design is quick, easy and fun to make and actually looks pretty nifty too. Not to worry if someone accidentally puts something wet in it, it only takes five minutes to make a new one. 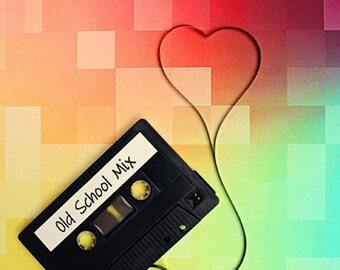 If you spent the Sundays of your youth recording the charts off the radio, this one’s for you. From a simple heart to a portrait of your pop idol, your imagination and artist skills are the only limits to what you might create. For anyone whose board game collection sits gathering dust. Boards and accessories can be combined with a regular clock mechanism to make a funky, fully-functioning timepiece. A bed-stand made from a washing machine drum. You’ll need: A washing machine drum, wooden top and casters (optional). This industrial-style piece of furniture could be adapted for use in any room and would suit anyone who likes something a bit different from bog-standard wooden furniture. You’ll need: colander, paint (optional). 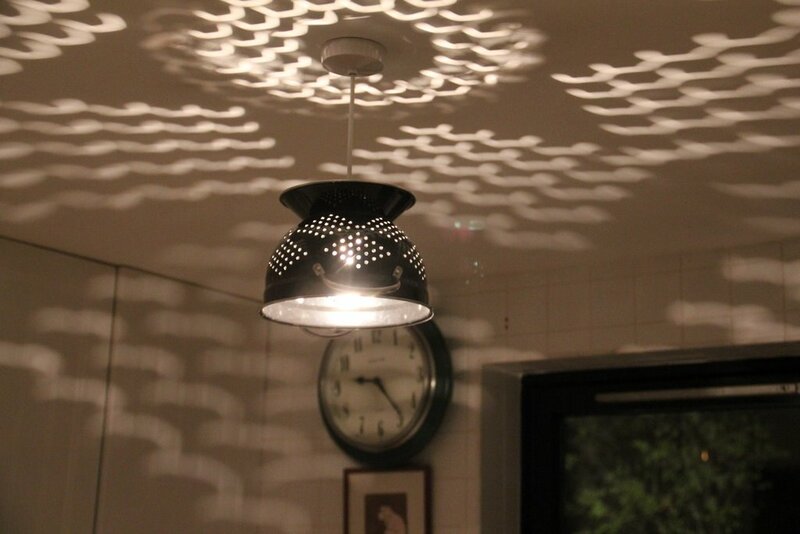 This colander fitting isn’t only for the kitchen, but for any room in the home. It can be left metallic or painted to fit in with a colour scheme and leaves fascinating patterns on the ceiling. This is great for anyone with a passion for travelling. Top scissor skills will prove helpful in creating the desired effect, and using a smartphone projector might come in handy too. A seat made out of a bathtub. For people lucky enough to have a bathroom big enough to have a seating area, this is the dream piece of furniture. For everyone else, it also works well in a lounge or bedroom. This is a quick, easy and cheap way of displaying your favourite snaps. It’s a great idea for anyone who rents their home and can’t put pictures up on the wall. A coffee table made from a wooden pallet. This pallet table can be left bare, painted or varnished, making it a versatile piece that works in any home. The only downside is that its height could make for some painful shins. A coin bank made from a classic camera. You’ll need: Old-style camera, standard toolbox equipment, tape, spray paint (optional). This piece would look perfect in the home of any budding photographer. It will also come in handy for anyone who has saved pennies by making their own furnishings. On Monday, March 9th, 2015 Block Posters wrote on the subject of Uncategorised. Wow! This site is absolutely fantastic, I’m really impressed with some of the ideas shown here. I will defo try a couple of these ideas myself. Personally, it’s the artistic individuality that I like, but what a great way for people struggling in the current economic climate to affordably introduce a little artistic decoration into their home. Very talented and creative! Thanks for sharing!